They compared HJ with Yamapi. They do look a like quite a bit, right? Anyway, I think this is about Korean Ikemen since I saw FT Island and Suju in the background. This is quite old right, 2007? Anyway, the more I see Minho, the more I like him. me too!he got the domyouji 'aura'.lol. I agree, he totally has the Domyouji aura...it's just that, his photos don't really justify that. I wish this would be a hit. Then they could create a special show wherein the Taiwan F4, Japan F4 and Korean F4 would meet plus their Shan Cai/Makino would meet. Hehe, is it just me or is Lee Min Ho looks like Toma Ikuta, the adorkable guy on Hanakimi. They look similar on some angles and when he's grinning. Gawd, the guy looks so yummy. I hope he does Domyouji justice and I believe he would. ETA: Dude, I hope the rumour of Kwon Ji Min is wrong. I'm not getting any Makino from her at all. Plus, she looks like a Han Gain wannabe. Makino Tsukishi is gonna be played by Goo Hye Sun!! O SNAP!! WELL THATS GOOD NEWS.. since like goo hye sun for sure can act lol. Goo Hye Sun to play the female lead of KBS 'Boys over flowers'. I do love Goo Hye Sun but I hadn't even considered her for this role. I was hoping for a younger and not-so-perfectly-adorably-cute-and-pretty actress for Makino. I don't think she looks tough enough for the part. I know she's a good actress and all...but I'm still finding this fact sort of weird. Also, cause she is older than all the guys!!!! 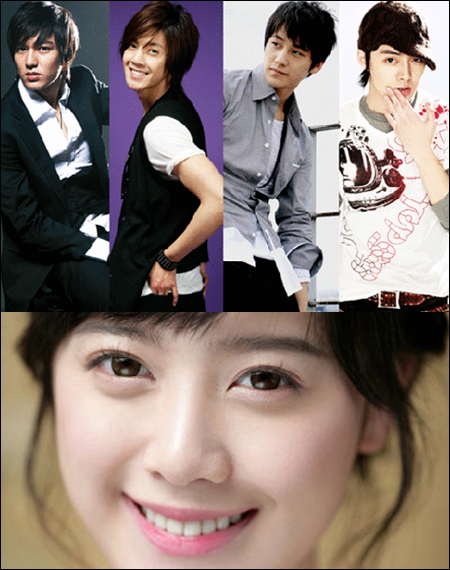 i like Goo Hye Sun but do I see her as makino? No! She looks too sweet and pretty to play the Makino part. wasn't she an uljang? *sigh* Park Shin Hye would have been perfect in age looks and everything else. I really can't picture Goo Hye Sun as Makino. I don't know its just weird; she looks too fragile and Makino is suppose to be tough. Hopefull she will prove us all wrong though. Okay. She's an 84-er. Isn't she a bit...ehhh, old? Is this confirmed? It's weird since Makino's supposedly younger than F4. I mean I love Goo Hye Sun plus her talent but...I will have a hard time seeing her as a highschooler. at least we know that goo hye sun can act. i really didn't want to leave makino in the hands of some inexperienced actor. okay, i saw this youtube video where like they combined different videos of the F4 cast, and i thought Lee Min Ho was soooo cute. He kinda looks like Lee Dong Wook. Dont get me wrong, I like Gu Hye-sun. A lot. I think shes one of her generations more promising actors. She can do vulnerable, and she can do inner toughness. She can cry. She can emote. I respect her for writing and directing her own short film. But Ive never seen her as serious contender for Makino Tsukushi in Boys Before Flowers, aka the Korean Hana Yori Dango, mainly because (sorry to sound shallow) shes too old. Born in November 1984, this also puts her older than all the F4 boys, although thankfully I do think Lee Min-ho in the Doumyouji role looks of an age with her despite the three-year age difference (hes a 1987-er). But since shes been picked, Ill be happy with it, I suppose. (And Im not outright disappointed about it, just surprised. At least it wasnt Lee Yeon-hee or Go Ara.) Director Jeon Ki-sang explains that he chose Gu Hye-sun because she fits Tsukushis image well, and acknowledges that the public had tossed her name around a lot as a prospective Makino when the drama was first announced. Goo Hye Sun is not fragile! i did not expect her for makino! gosh. i hate this cause in the japanese version domyouji was my fav. I can't picture GHS as Makino too. She's a great actress but too old and too pretty to be Makino. I see her as an elegant and regal young lady, not the street/brassy type. I see her as possibly Makino's evil friend or Rui's Shizuka, but not Makino. Well, good thing we have a good actor on board. I hope GHS proves me wrong and goes on to become the best Makino out of three adaptations. u know, they got chosen for a reason. The PD had in mind who he/she thought were good for the drama. When temptation of wolves came out with the cast, I was really against the main female character, but u know what, lee chung ah did a REALLY great job with that movie and is now one of my favorite actresses. So even if we didn't see some of the people in the cast as the characters in the drama, let's just wait until AT LEAST the trailer is out. you got to give them the benefit of doubt. The best acting comes out in an actor/actress in a role that no one sees them in, because the actor/actress tries even hard to fit into that character. I agree with deeta. Goo Hye Sun is too pretty and elegant to play the plain makino? the taiwanese and japanese actresses looked really plain, but when they had a make-over they were gorgeous... just like a priceless gem you have to polish for others to notice. well, make-up does magic.. hopefully it'll make her look plain in the beginning. i'm looking forward to see Kim Bum! I wonder who's gonna play Shizuka.